The streets of tomorrow could look very eerie. Wake up. Have coffee. Slip into your costume designed to look like the front seat of a car so you can drive around Arlington, Virginia, in a Ford minivan like a ghoulish, driverless spector. Spook some humans in the name of science. All in a day’s work. This (dramatic) retelling details a real experiment by engineers at Virginia Tech Transportation Institute and Ford that went viral last week. They wanted to see how people responded to a self-driving car, and after reporter Adam Tuss from NBC’s Washington D.C. affiliate spotted the car and tweeted about it, the internet was hooked: what was this mysterious, driverless machine? Part of the worry is that experts aren’t sure how humans, whether walking, driving or biking, will interact with autonomous cars. If there’s no driver, who do you receive a little nod from to get the go-ahead to walk across the street? Who do you lock eyes with at a four-way stop to glare at and gesture wildly that you’ve missed your turn three times in a row? And this is more nuanced than we may think. “There is a subtle interplay of gestures and body language that pass between drivers and bystanders on the road,” Cliff Kuang wrote in a piece about the hoax-slash-helpful research for Fast Co. Design. And in a world of automated cars (and automation in general) nuance is one of the first things to go. Since regulations regarding how to test self-driving cars complicated the candid-camera type reaction the engineers needed, the team at Virginia Tech Transportation Institute and Ford found a nice little loophole. Enter the ghost-driver. Someone (still nameless) wore the expertly camouflaged suit to look like the front seat of the car, so when it drove by, it looked like there was no one behind the wheel. 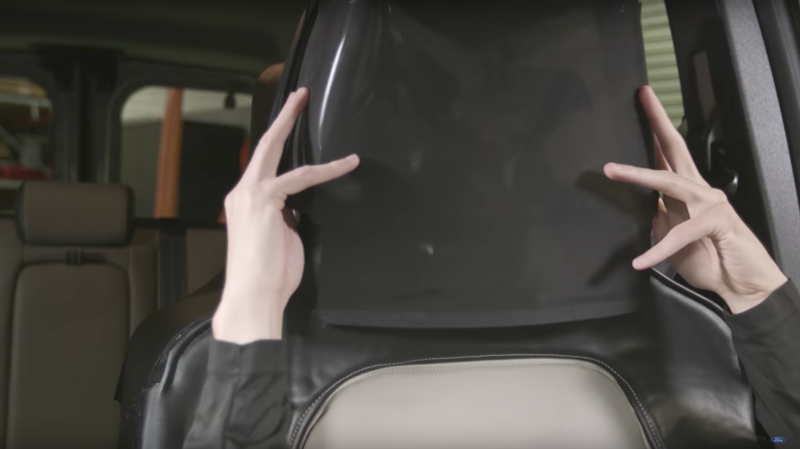 The engineers used a variety of illusions to make it happen, according to Kuang, including specialized controls so that “the drivers would never have to lift their hands into view.” The ghost-driver recorded a total of 1,800 miles of road data spanning 150 hours, equipped with microphones and high-resolution cameras to record what was happening around the car. The main feature the engineers were testing was a lighting system designed to let people know what the driverless car was doing. They placed a white light on the windshield where a “solid white light means the car is driving itself; two white lights moving side to side mean the car is yielding; and a rapidly blinking white light means the car is about to start accelerating,” Kuang wrote. Using the recording equipment, the engineers could log whether people looked surprised or oblivious, for example, and for how long, according to Kuang. You can see a few reactions to the ghost-car in this video about the experiment. Most observers do a double-take when they realize the car has no driver. Others, like a biker, don’t really seem to notice and or care. A group of guys simultaneously reach for their smartphones to take photos while pointing and laughing at the car. Those lighting signals are brand new, and obviously no human in the vicinity of the cars seemed to understand what they meant. But if all autonomous car-makers standardized some sort of similar signal system, and people knew what it meant, it could make things safer when these cars are actually on the road. So yes, the slightly off-putting science experiment had a greater purpose. “In a car with no one in it, you’re talking not just about how the customer reacts, but how other people behave around it,” John Shutko, a human factors specialist at Ford, told Kuang. This seems like a viral story that everyone forgets about in three days, but the implications matter. In reality, the ‘ghost driver’ is a complex look into the weird ways humans are navigating a world that is, by our own design, becoming less and less dependent on humans. Read more on Fast Co. Design. Roboethics: Can Code Be Humanized?